“It could take years to build a business reputation, but a few minutes to wreck it”. If you know and understand this fact, you will do things in a different way for your online business brand reputation. Do you know, according to a study from the London School of Economics, a 2% decrease in the negative word of mouth increases sales growth by 1%? 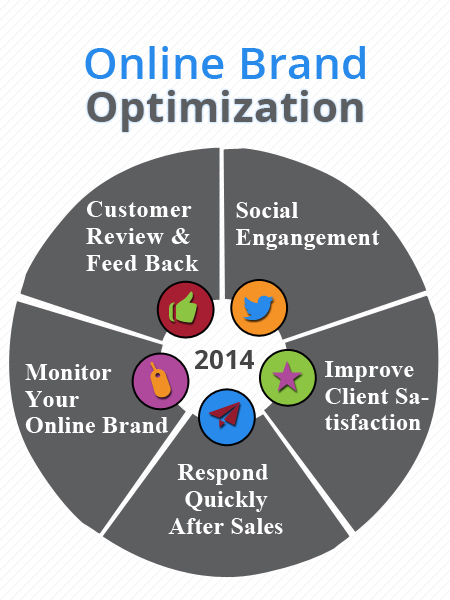 Therefore, online reputation management requires being a central focus in 2014 for marketers. Managing online brand reputation in not optional but mandatory for all types of businesses (small to large), and required perfect strategies and techniques, which combine monitoring and responding appropriately to make sure your reputation that can be easily affected by negative comments by online users. For making positive your online reputation, marketers must have a perfect plan in put to respond to negative reviews. They ought to know what their customers, competitors, and critics are saying about their band and products online. Below, we’re giving top five tips that can help you in making your online reputation stronger. One of the best things about the Internet is that it provides an opportunity to its users to express their thoughts, opinions and experience on almost everything whether it’s about products and services of companies or any political issue. It is an easy and simple way for customers to comment on products and services, which are posted on social network sites and websites like Cnet Reviews. They help other buyers in buying anything. Besides, they also provide an opportunity for businesses to turn unsatisfied customers or buyers into frenzied fans. As business owner, we cannot ignore or stop what is being posted by people on your company’s brand online. Reviews can be both positive and negative, will be posted whether we want them or not. Remember, we can use positive reviews for making online brand reputation by posting them in our sites, blogs, videos etc. However, we ought to respond to negative or bad reviews and try to resolve them quickly as they can badly impact online brand of any business. Bad reviews can turn into good, if you respond quickly on them and make it right for your customer. Remember, quality products and services reflect a positive image on your online reputation, strongly add on the people by leading discussions about challenges trends and solutions.Hence, showing your company’s brand provides excellent customer services. For increasing positive reviews, you can ask satisfied customers to post reviews. Do you know, each year a company loses 10% to 25% of its existing business because of poor customer services? According to study, an unhappy customer tells approx 11 people, and they tell approx other five as a result about 55 people are not satisfied about that services. Happy customers buy products and services regularly from you and also spread the word by recommending about your business to friends, family and relatives as a casual referral process. Remember, bad production or delivery of goods lead to distressed customers, and high customer happiness deliver lots of benefits, including Loyalty, Repeat purchase, Retention, Reduced costs, and Premium prices. Business can achieve customer satisfaction simply by listening customers, offering then high quality and reliability in products and services. When anyone is not happy, then do everything in to resolve his or her complaint. There is nothing more important in business than customer satisfaction. Word of mouth sometime can not generate new customers or business sale. But with help of social media, you can produce a buzz around your brand. Almost all the online marketing companies agree on social media marketing or engagement is usually based upon the interaction between the business customers. The relationship between business and social media has shifted further than infancy, and companies cannot measure their customer engagement percentage by counting likes, tweets or share. Social sites such as Face book, Twitter, LinkedIn, Pinterest, Typad etc are some of the major valuable sites for interaction or engagement, but not fully utilized by business. Today, they are playing an important role in making online reputation strong. You have to more beyond sending a posting or tweet on your face book or twitter page to completely engaging with online users or customers. Remember, what you share in your social media page must be unique, original and attractive. The technology has forced businesses to develop stronger relationship with customers online and online users are turning to social media sites to interact or communicate with other customers and businesses about products and services, which they love. Remember, responding quickly is important same as listening your customer. Social sites such as Twitter and Facebook have given companies to lead that conversation as well as take charge of their brand’s business image. We know that it is impossible to make everyone happy in businesses, and social sites are the prime points where unsatisfied customers complaint first. It is believe that more than 35% customers expect response within 30 minutes. We are not saying if you could not reply within this time, then all the hope is lost. People who post negative reviews and received a quick reply with solution generally went on to become reliable customers or deleted the negative post and post a positive one. Therefore, always address and resolve a customer complaint quickly and increase the chances of converting that into passionate fan. On the other hand, if you take more time to reply, then the greater of the chance it will attract worse reviews or complaint. What exactly people talking about you in real time? Monitoring a brand shows businesses lots of things, including where they require improving, where they are doing an excellent job, what their customers’ needs and many more. Monitoring is like responding, whether it is a direct question, praise, or complaint, a response is really required every extra social media accounts like FB, Twitter and anywhere. Discussions happen all the time in such social sites so presence on these sites is really increasing your online brand reputation. The main focus must be on reputation management and knowing when customers are saying badly about your brand. It is really vital, it is not only about responding to the negatives. You must hear the good things as well, which people are saying or posting about your business. Google alert is really nice tool by Google that allow to monitor interesting notification about brands or products. Remember, online brand reputation management has been a very old and important feature of staying in touch with the customers. We hope that these top five tips will be helpful for you. Let us know if you have any query related to online reputation management .